Lindsay Close, of Exeter, posted the second fastest time for a New Hampshire woman at last year’s Boston Marathon. Mark Furler, of Hollis, who has only been running competitively since 2015, posted his personal best in last year’s race. They’ll gather under a tent just past the race’s 18-mile mark, as they do every year. Many members of the Gate City Striders will be at Monday’s Boston Marathon to cheer on the race participants, especially the runners from their own club. The Nashua-based Gate City Striders have been around since 1979 and, with more than 600 members, claim to be the largest running club in New Hampshire. The club benefits from a prime location — between Manchester and Lowell, Mass. — but that’s not the only reason for its popularity. Gate City Striders president Steve Rouleau said the club offers something for everyone in terms of both distance and pace. “We welcome everybody,” he said. “The competitive side of our club is the smallest part of our club. It’s $25 for a year — you can’t beat that. You more than get that back with the coaching we offer. Yuki Chorney and Lindsay Close are two of the women who will represent the Gate City Striders in Monday’s race. Chorney, who lives in Mont Vernon, has competed in the last 10 Boston Marathons, and ran the 39th fastest time for a woman in a 100-mile race in North America last year when she finished New Hampshire’s Ghost Train race in 19 hours, 22 minutes and 13 seconds. Close, 37, recently moved from Milford to Exeter. She set a personal record when she finished last year’s Boston Marathon in 3:05.20. It was the second fastest time by a New Hampshire woman overall. “What makes the Striders unique is they’re so woven into the community,” Close said. “There really is something for everyone, whether you’re training for your first 5K or training for your first Boston Marathon. Then there’s 36-year-old Hollis resident Mark Furler, a Gate City Striders member who is also the race director for the Gate City Marathon, which will take place May 19. Furler will wear bib No. 500 tomorrow, and his story is a unique one. Furler was a rower at Rochester Polytechnic Institute, but didn’t start running competitively until 2015, when he bought his dog, Shelby. Initially he ran so Shelby could get some exercise and things progressed after that. 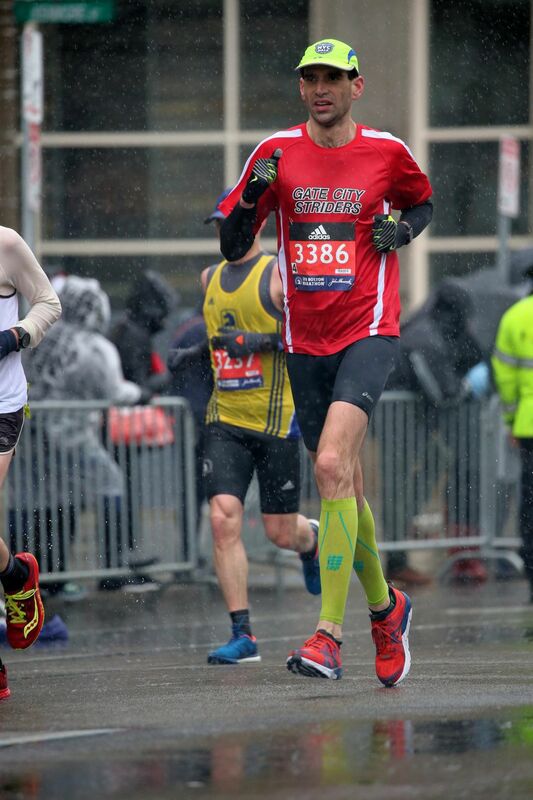 He posted a personal record (2:46.48) at last year’s Boston Marathon, then topped that mark when he finished 144th in the New York Marathon last fall (2:38.30). When the weather allows it, Furler still runs with Shelby two or three times per week. He said there are many racing teams in New Hampshire focused on the competitive aspect of running and there are other running clubs that are primarily about recreational running. Close will be running in the Boston Marathon for the seventh time this year and it will be her 17th marathon overall. She said she’s hoping to better the time she posted in Boston last year.